We thought for sure Android‘s Market for apps would have blown past, or at least caught up to Apple’s iPhone App Store by now, but a look at the most recent numbers show it still has some work to do. Apple has 350,000 apps in its App Store to Android’s 250,000. However, the rate at which apps are coming into Android’s store is faster than Apple’s App Store. In the next few months we expect the stores to be equal. Want to get the Chart Of The Day a day earlier? Sign up for our Chart of the Day email. Apple’s iPhone war against Google Android was the big story in tech last year, with Android growing like a weed to beat Apple in U.S. market share. That is going to change now that Verizon will start selling the iPhone next month, and now that AT&T is going to start offering more Android devices. And by the end of the year, we will have a much better sense of which phones people like better — at both major carriers. As of late 2010, the iPhone was the major platform at AT&T, representing 63% of its smartphone customers. At Verizon, Android and RIM basically split the pie. We’ll see where these numbers are in another year. Will Verizon users flock to Apple’s iPhone? Or will Android’s wide variety of different devices win the market? 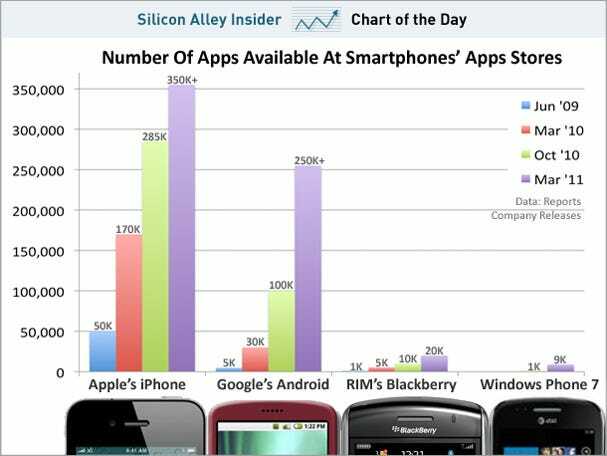 And what happens to RIM? Verizon Wireless should announce Tuesday that it has struck a deal with Apple to sell the iPhone. That’s good news for Apple, as it means more distribution for the iPhone. And it’s good news for Verizon, because now it has the mega-hit iPhone, which has been exclusive to archrival AT&T since its launch. But it’s bad news for Google, maker of the Android operating system. Verizon, desperate to compete with the iPhone, became Android’s biggest U.S. supporter last year. As a result, almost half of all U.S. Android subscribers belonged to Verizon late last year, according to comScore. We don’t expect Verizon to forget about its successful Droid lineup. But as it puts more marketing muscle behind the iPhone, Android will probably suffer. The question now is whether the other carriers — especially AT&T — can make up for whatever Android loses at Verizon. Facebook is on track to generate $2 billion in sales this year, a nice milestone for the social networking king. In part because of this news, investors are piling into Facebook stock on the private markets at a $56 billion valuation. The assumption is that Facebook is the next Google, a money printing machine that might eventually even be BIGGER than Google. While it’s possible that scenario will play out, it’s worth looking at how Facebook’s revenue growth compares to other online-advertising-driven companies, such as Google and Yahoo. 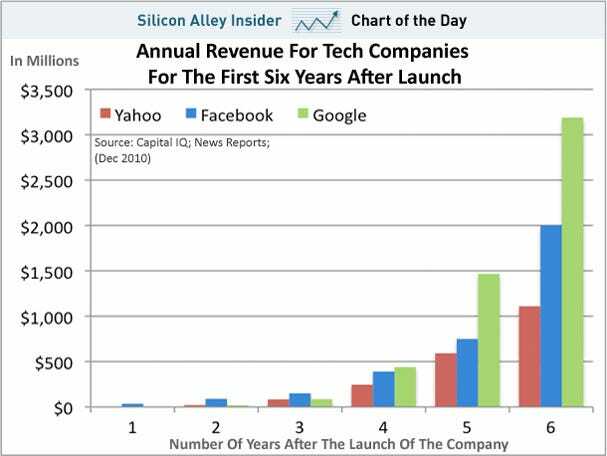 It’s true that Facebook did not emphasize revenue early in its early years, but neither did Google. And as you can see below, when Google did put the pedal down, its revenue grew much more rapidly than Facebook’s. So those who are counting on Facebook becoming a bigger business than Google had better hope it has another ace up its sleeve. Gaming consoles are the new media hubs, according to data from Nielsen. 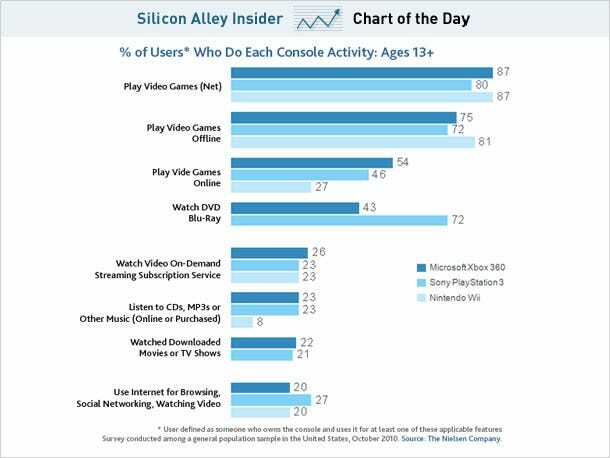 About one quarter of the people that own a Xbox, Wii, or PlayStation are using them to watch web video. This is a pretty impressive number, and it’s interesting to think about in light of Google TV and Apple TV. If many console users are already streaming video, then there’s less need for either Apple or Google’s boxes. Further, a Logitech Revue running Google TV software goes for $300. An Xbox 360 with Kinect goes for about the same amount. Would you rather have an advanced gaming machine with some web streaming, or device for just web video that only works okay? Surprise! 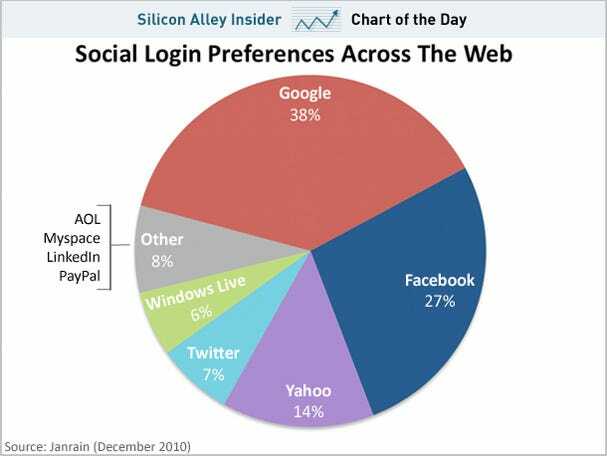 Google login is used by more people than Facebook Connect, according to data from Janrain Engage, a site that puts login widgets on websites. 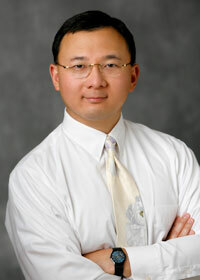 Janrain based its data on logins across 300,000 different websites. When we saw this chart we almost didn’t believe it. After all, Facebook Connect gets most of the hype and attention. Further, companies are using Facebook Connect as a cornerstone of their business, something that must scare Google. The good news here for Google is that it has traction with people logging into different sites. If it can settle its internal battles over social, it could build a universal login product that rivals Facebook, and produces similarly valuable information. Here’s a chart that’s hard to believe: Apple will own just as much of the mobile ad market by year end as Google, according to estimates from IDC provided to BusinessWeek. 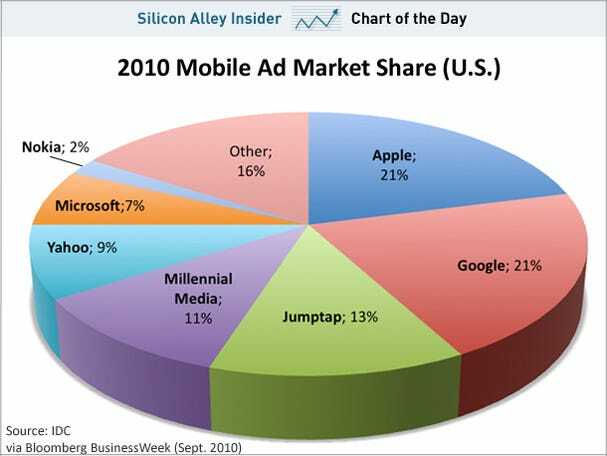 While this is impressive for Apple, it mostly underscores how tiny the mobile ad market really is. 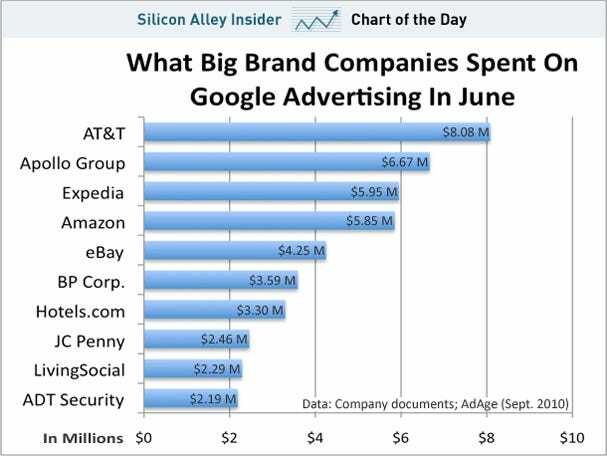 IDC estimates only $500 million will be spent on mobile ads this year. Apple announced it had commitments for $60 million in iAds in June, which suggests IDC is estimating it picked up another $45 million in the second half of the year. Over the weekend, Ad Age published a look inside Google’s core business of search after reporter Michael Learmonth obtained internal documents listing how much various brand advertisers spend on keywords.